**New Giveaway** EAT LIKE A UNICORN! 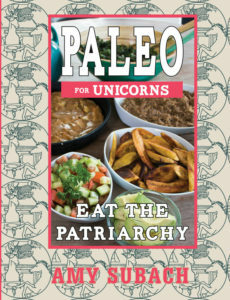 If you haven’t seen Amy Subach’s colorful cookbook, Paleo For Unicorns: Eat the Patriarchy, we’re sorry to say you’re missing out. 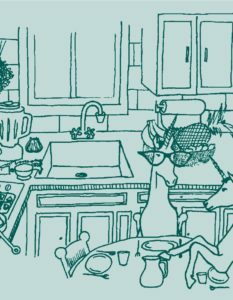 This creative guide to cooking healthy food quick and easy that tastes good and doesn’t drive your body crazy. ♥ Learn basic cooking skills! ♥ Figure out how to make a bunch of food with not too much cooking, even if you have a lot of restrictions! ♥ Dismantle the body shaming diet industrial complex! ♥ Make food that even little kids will love! Paleo, as I’ve come to define it, is a way of eating that that includes meat, organ meats, vegetables (but not legumes), fruits, nuts (not peanuts because they are technically legumes), fermented foods, natural sweeteners, and sometimes dairy (raw, organic, goat, etc, if you tolerate it). It does not include grains (wheat, corn, quinoa (not really a grain actually), rice, etc), white potatoes (except sometimes it does), french fries (bummer, those are so good), processed junk foods, industrial seed oils, sugar, or alcohol. 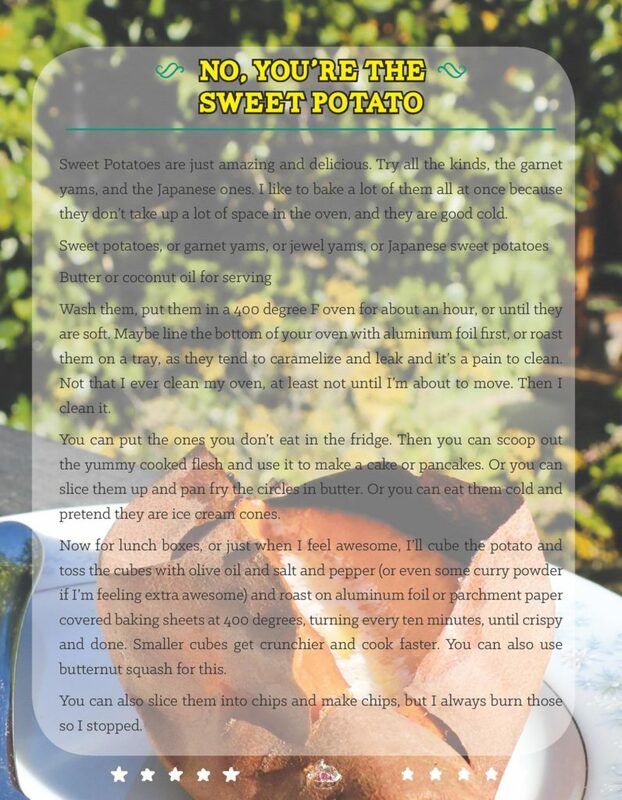 Easy paleo (and mostly paleo) recipes make up the meat and sweet potatoes of this book. The recipes are easy, because while I love cooking and have since I was making mud biscuits in the backyard (not a euphemism for pooping outside, this time), I have two small kids and I have no patience for any recipe that is finicky, requires a lot of special ingredients, or takes a lot of time. One more thing: books about diet and health often make the reader feel less- than, like they need to change. I know that change is hard. I know it is a perpetual challenge for me to love and accept myself in the capitalist patriarchal racist imperialist society we live in, and as a cisgender white woman I have it pretty damn good. As the badass Audre Lorde has said, “Caring for myself is not self-indulgence, it is self-preservation, and that is an act of political warfare.” Please accept this book as a guideline for how you can better love and care for yourself. Let me say this: You are ALREADY worthy of love. YOU ARE A DAMN UNICORN. Check out preview pages below, and, as usual, you have several different ways to enter via the Rafflecopter box below: following us on social media, tweeting about the giveaway, sharing the link, or signing up for our newsletter. Choose one, a few, or all of em, and may the odds be in your favor! Check out all the book details (available in bookstores next month) at Microcosm.Pub/paleoforunicorns. You can follow Amy and the cool stuff she does at AmySubach.com or on twitter @amysue. We’ll be giving away 10 free copies of Paleo for Unicorns, with a board game catalog and stickers, to 10 random winners selected via Rafflecopter. if you’re outside the US or Canada, you’re still welcome to enter, but we will request help paying for the very large shipping costs. Every few months a batch of brave young creatives joins our crew for a while to learn, explore, and help out around the office. Some volunteer for fun, experience, out of boredom, or for school credit, and every year we get more and more requests for “how can I help!” and “do you take interns?”. So I wanted to take a minute to introduce you to what being a volunteer here is actually like, from the volunteers themselves. It’s been a while since I was one myself, so I asked a few others to talk about their average day. Check out the juicy details below.